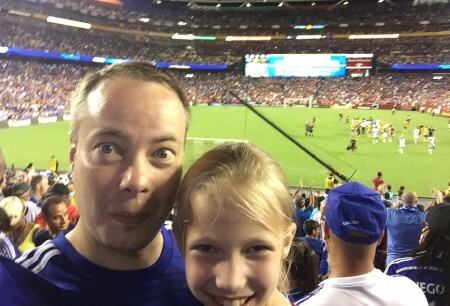 We knew that we wanted to go on a short road trip or two this summer and when Scott found out that Chelsea (English Premier League Soccer) was playing in Washington, DC, we added it to the list. 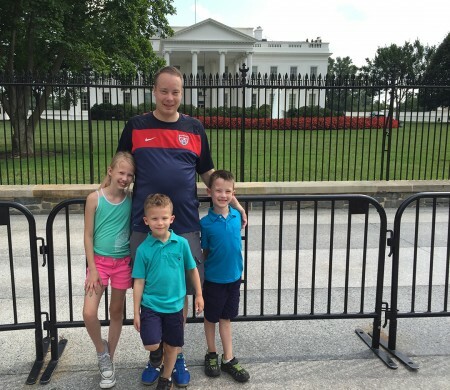 On our last full day in DC we headed to into the city in the morning and planned to visit the original Smithsonian Museum and walked all the way up to the main entrance before we found out it was closed for renovation. 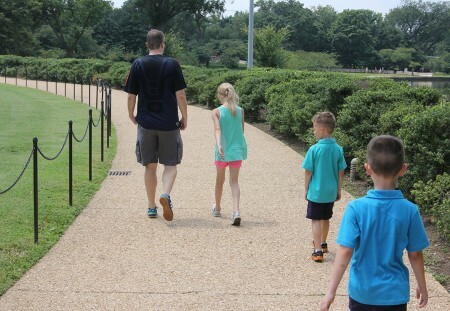 So we changed plans and started walking toward the Tidal Basin – it was a long walk and we were all hot and starting to get grumpy by the time we reached the Jefferson Memorial. 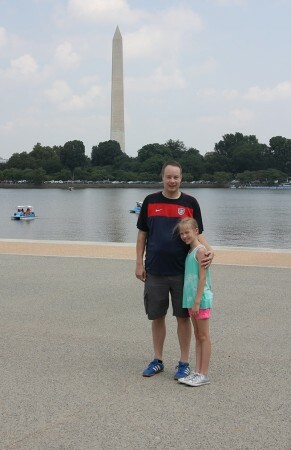 We took a break in the shade of the Memorial before continuing our walk around the Tidal Basin. Next we stopped at the FDR Memorial and the final stop was the Martin Luther King, Jr. Memorial. 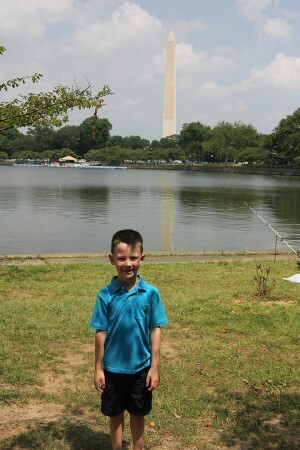 Then we continued around the rest of the tidal basin and headed back toward the Mall. 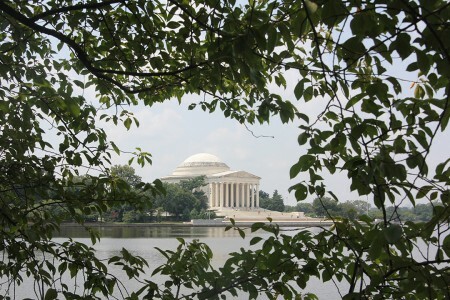 The Tidal Basin trail is 2.1 miles plus the walk to and from the Mall. We were hot, grumpy and the sunscreen we had applied at the hotel had sweated off and several of us were starting to burn. 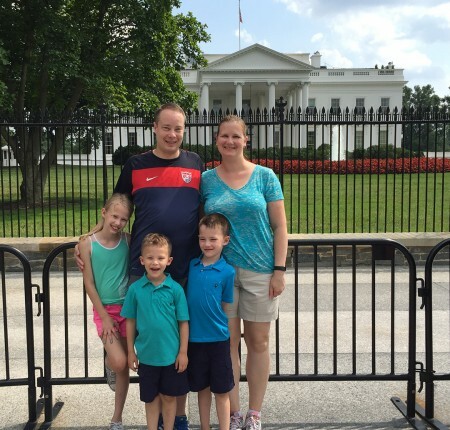 We walked across the Mall and decided to go to Old Ebbitt Grill for lunch. I have always been dressed up to eat there so I was little uncomfortable walking in wearing shorts and sweaty and with three kids. But they sat us in a back part of the restaurant with other families and we had a delicious lunch, drank lots of water and cooled off. 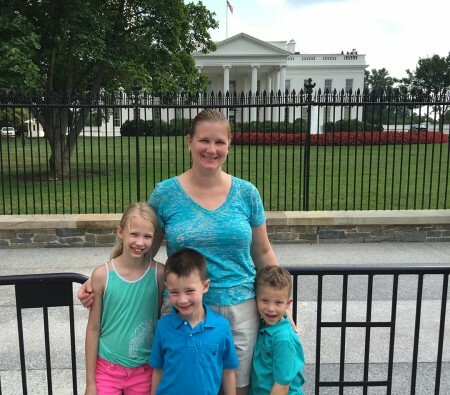 After a relaxing lunch and desert we walked to The White House and took the obligatory pictures. It was mid-afternoon and we asked the kids if they wanted to explore some more or go back to the hotel. 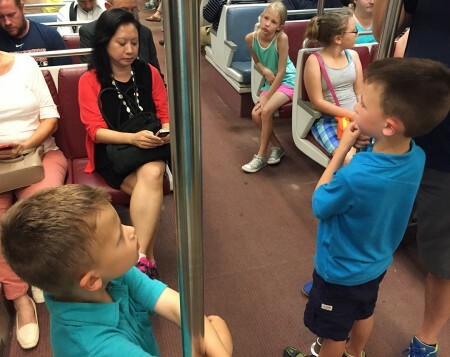 The children were not ambivalent about their choice so we headed to the Metro and back to the hotel. Juliana’s face in this picture says a lot about how tired they were at this point. Back at the hotel Scott and Juliana took a short break and then got ready for the game. 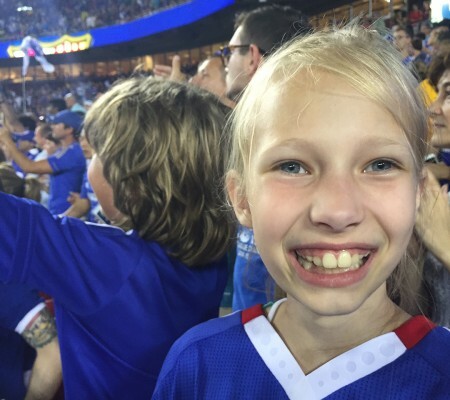 They had a lot of fun at the game and Juliana said that it was one of her favorite things about the trip and I know that Scott would agree. 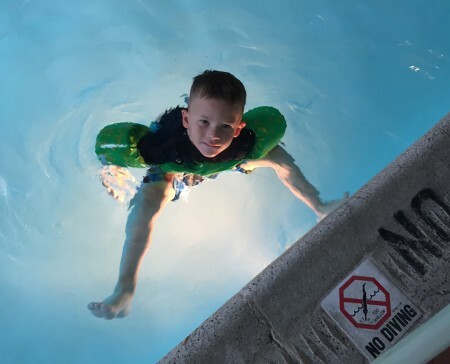 I took the boys to the pool and let them swim for a while. Then they took a bath and we ordered pizza. 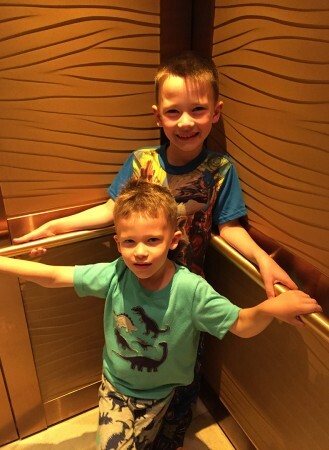 They thought it was very fun to ride in the elevator and walk around the hotel lobby in their pjs when we met the delivery man. 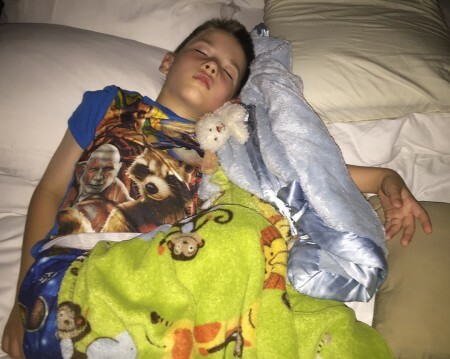 The boys told me that their favorite part of the trip was eating pizza while sitting on the bed in the hotel room, swimming in the hotel pool and of course hanging out with Uncle Nick. So next summer we should just stay at a hotel near Uncle Nick’s house where they can swim and skip all of the walking.